Once every three months, my colleagues and I have to get into work very early (5am early) and once we are done with the urgent work, we go out for a team breakfast around 9am. One colleague said he had often walked past the English Restaurant in Spitalfields and was curious about the name and what it was like, so we decided to try it for our breakfast. The English Restaurant is a family-owned restaurant boasting fine wines, ports and brandies on its exterior; the interior is oak panelled, resembling a pub perhaps more than a restaurant, but still managing to be bright and airy. The menu does indeed sound very British - dinner choices include steak and onion pudding, braised pork cheeks and rabbit braised in cider, with desserts like bread and butter puddign and rhubarb crumble. I had to look up pan haggerty, which is apparently some sort of potato, onion and cheese dish from Northumberland. They also offer afternoon tea, but we were there for breakfast. I was impressed by the number of options on the breakfast menu - perhaps the restaurant's proximity to Spitalfields market, and the number of early bird workers in the area, explains it. You can have yogurt, granola, porridge, kippers or bubble and squeak, kedgeree, all kinds of eggs, a bacon or sausage sandwich and of course the full English or vegetarian breakfast. One of my colleagues went for the full English, which he said was excellent. I've never really liked the full English breakfast but this time wanted something more than a sausage sandwich, so ordered the eggs royale - smoked salmon and poached egg on an English muffin, topped with hollandaise sauce. 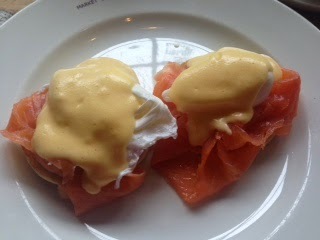 I actually thought this was eggs Benedict but apparently that uses ham or bacon instead of smoked salmon. It was absolutely delicious, really filling and at £8.40 not the cheapest but definitely worth the money. This is a gem of a restaurant with 'proper' food, friendly service and I hope they are able to remain independent.